UH Seidman Cancer Center at UH Parma Medical Center is holding a community open house on Saturday, April 27 from 9 a.m. - noon. University Hospitals Parma Medical Center invites the public to the reopening of the Radiation Oncology Department at its UH Seidman Cancer Center following a $3 million renovation. At a community open house on Saturday, April 27 from 9 a.m. to noon, visitors can tour the facility, enjoy breakfast and meet two new oncologists and a cancer navigator to guide patients through their cancer journey. Visitors also can participate in health screenings and see the state-of-the-art linear accelerator that delivers radiation treatments to patients. UH Parma has had a cancer center since 2000. 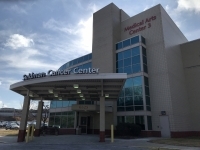 As part of the UH Seidman Cancer Center’s expansive network in Northeast Ohio, the UH Seidman Cancer Center at UH Parma is among 18 community sites that offer cancer care close to home. The new Elekta VersaHD linear accelerator brings the center the latest state-of-the-art technology for radiation treatments. Kevin Kelley, MD, Board-certified in Radiation Oncology. The Cleveland native attended medical school at Wright State University and completed his residency training at Hofstra University. He is proficient in all major modalities of modern radiation oncology, including intensity-modulated radiation therapy (IMRT), image-guided radiation therapy and brachytherapy, and stereotactic radiosurgery. Jennifer Muller, MD, Board-certified in Hematology & Medical Oncology, who comes to UH Parma from Southwest General Health Center. She went to medical school at Northwestern University, completed her residency at Duke University and her fellowship at UH. Her specialty areas are breast cancer, chronic leukemia and lymphoma, myeloma and cancer genetics. A new cancer patient navigator will guide patients through referrals, scheduling and obtaining pre-certification for procedures and treatment, and connecting patient with supportive services needed to alleviate anxiety for the patient trying to navigate themselves through the system. In Medical Oncology on the second floor, Specialty Pharmacy is undergoing major updates to advance its focus on patient care. Specialty Pharmacy is pivotal in helping patients obtain answers to questions about their cancer drugs. This renovation is prompting a noticeable change to the layout of the waiting area on the second floor.